One of the most renowned Dutch still life painters, Jan van Huysum was well known for his fervent pursuit of perfection when it came to his floral masterpieces. He would often paint vases filled with flowers from all the seasons – waiting patiently for each to bloom in its turn. As such, some of his paintings took several years to finish. But the brilliant colors and delicate detailing is worth it. 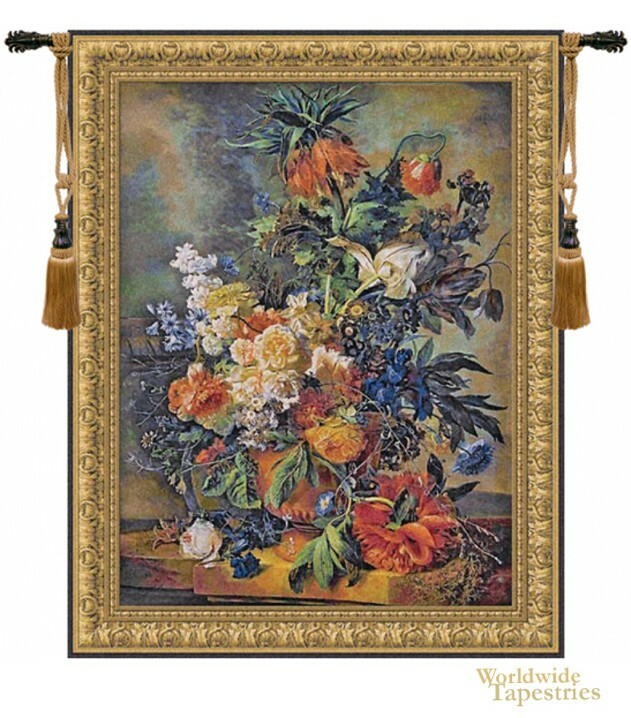 “Bouquet Dore” is a fine example of his artistry. The flowers are bursting from the vase, shone by the morning light coming from a nearby window. If you look closely enough, you can even see the beads of water collecting on the leaves. The textures of the flowers are remarkable, and makes the entire scene come to life. This tapestry is lined and has a tunnel for easy hanging. Note: tapestry rod and tassels, where pictured, are purchased separately. Dimensions: W 36" x H 46"
Dimensions: W 44" x H 56"